Runner passing occurs when a trailing baserunner passes a preceding one. Time to Pass a Runner is our 11th Case Play of the 2016 season and, like Case Play 2016-10, concerns a Replay Review decision flagged for discussion by tmac. Diagram of the Runners Passing Case Play. The Play: With one out and one on (R1), White Sox batter Tyler Saladino hit a 1-2 fastball from Royals pitcher Matt Strahm to deep left-center field, where the ball fell onto the warning track untouched before bouncing over the outfield wall as Royals outfielder Jarrod Dyson unsuccessfully tried to glove it. Initially ruled a two-base award for Saladino and baserunner R1 Leury Garcia, giving Garcia third base and Saladino second base, the play was challenged by Royals Manager Ned Yost, who alleged that Saladino had illegally passed Garcia on the base paths, and therefore, should have been declared out pursuant to Rule (Garcia would still be awarded third base). After review, however, the Replay Official ruled both runners safe and placed them at second and third base, explaining in his decision to confirm the on-field ruling, that "The runner was not passed by another runner prior to the ball going out of play." NY/Replay's Explanation in Confirming the Call. Question: Is this the proper ruling, given visual evidence (or assuming that the evidence indicates) that Saladino did pass Garcia, but only after the ball had become dead by virtue of it bouncing out of the playing field? If not, what is the proper ruling, and who would get credit for the putout (if applicable)? In other words, assume Crew Chief Fieldin Culbreth ruled the runners did pass each other, but only after the ball was dead, and assume this is visually correct. The question at hand is whether or not the ball becoming dead has any bearing on the legality of the trail runner's passing of the lead runner at some point during the dead ball period. Does the runners passing rule become suspended/not applicable when the ball is dead? Answer: If Yost specifically challenged that the runners passing action occurred prior to the ball going out of play (as the above graphic and explanation from NY/Replay HQ indicates), then this is the proper ruling, as the passing did not occur during a live ball ("The Replay Official shall have no authority to review any calls other than those included in a Manager's Challenge or those accepted for review by the Crew Chief" Replay Review Regulation II.I). Rule 5.06(b)(4)(I) Comment specifies that a base award without liability to be put out "does not relieve [a runner] of the responsibility..." For example, a batter-runner who hits a home run must still touch all bases in order. If a base is missed, the defense may appeal when the ball next becomes live. However, does this responsibility extend to other baserunning obligations, such as passing or abandonment? Abandonment may occur during a home run. A runner may not be put out during a dead ball—this is why the defense must wait for the ball to become live before lodging an appeal—but this isn't to say a runner may not be declared out during a dead ball. "Put out" is something the defense does, whereas "declare out" is something the umpire does. For example, with one out and the bases loaded, B1 hits a game-winning home run, and runs across the field to celebrate before the winning run crosses home plate (for simplicity's sake, assume B1 already touched first base). 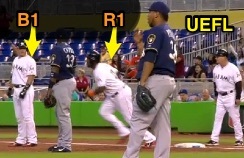 B1's run will not count, as B1 never legally touched home plate and therefore will be declared out for abandonment, even though this action occurs when the ball is dead. The winning run thus will score with two outs. A passing runners play from earlier in 2016. A similar circumstance exists with passing runners. This occurred in Case Play 2016-3, when Marlins batter JT Realmuto passed baserunner Marcell Ozuna during an apparent home run. Originally no-called, the Replay Official in overturning the on-field ruing simply explained that runner passing occurred, without regard to the timing relative to live/dead ball (the definitive angle used to overturn the call appears in the image to the left—the ball's location was not considered as it was in Chicago). Similarly, Orioles batter Javy Lopez was declared out by 2B Umpire Gerry Davis for passing baserunner Miguel Tejada during a 2006 non-home run in Baltimore, while Robin Ventura hit a grand slam single during the 1999 NLCS after failing to legally run the bases during a dead ball. Naturally, the umpire may reverse the passing if doing so will nullify the defense's illegal act (for instance, passing may be reversed/cancelled/nullified if the defense has obstructed the offense, for instance by face guarding, jockeying, or improperly blocking R1's view, and doing so will nullify the obstruction). F4 is closest to the passing & gets the putout. The only consideration in regards to the "put out" is scoring the play: the fielder closest to the violation receives credit for an unassisted put out (9.09(c)(4)). Technically, however, the offending trail runner is declared out by the umpire, rather than physically put out by the defense: there is no tag. Retrosheet.org has a list of notable Passing Runners situations that have occurred over the years, including several instances of batters and runners being declared out for passing that occurred during a dead ball. NFHS vs NCAA vs OBR: All codes agree, passing can occur during a dead ball. However, only NFHS does not treat runner passing during a dead ball as a time play. PLAY: With two outs and two on, B1 hits a home run. After R3 scores, B1 passes R1 on the bases. Undeterred, R1 completes his HR trot and touches home plate. RULING: In NFHS, R3 & R1's runs both count. In NCAA & OBR, only R3's run counts due to the timing of the third out. NOTE: If the bases are loaded with two outs and B1 walks on a 3-2 pitch, after which R1 passes R2, then R3's run shall count whether or not he touched home plate prior to the third out, since he was forced home. OBR 5.05(a)(6): "A fair ball, after touching the ground, bounds into the stands, or passes through, over or under a fence, or through or under a scoreboard, or through or under shrubbery, or vines on the fence, in which case the batter and the runners shall be entitled to advance two bases." 5.06(b)(4)(I) Comment: "The fact a runner is awarded a base or bases without liability to be put out does not relieve him of the responsibility to touch the base he is awarded and all intervening bases." Rule 5.06(c): "While the ball is dead no player may be put out, no bases may be run and no runs may be scored, except that runners may advance one or more bases as the result of acts which occurred while the ball was alive (such as, but not limited to a balk, an overthrow, interference, or a home run or other fair ball hit out of the playing field)." OBR 5.09(b)(9): "Any runner is out when—He passes a preceding runner before such runner is out." OBR 5.09(b)(9) Comment: "A runner may be deemed to have passed a preceding (i.e., lead) runner based on his actions or the actions of a preceding runner."